I received products for review from Salonpas. The opinions within this post are of my own and I was not influenced in any way. Please do your own research before purchasing products or using services. Your opinions and results may differ. Salonpas, a company I learned of last year, sent me some pain relief products to survey. Salonpas is a leader in external analgesic products, and I like it as much now as I did a year ago. The company name Salonpas comes from its active ingredient, Methyl Salicylate. Methyl Salicylate passes through the skin and goes directly to the site of your pain, right where it hurts. Their products are intended to provide symptomatic relief of conditions where pain is present. The newest to the line is Salonpas Pain Relieving Patch. It includes three active ingredients, camphor, menthol, and methyl salicylate, which provides temporary relief of minor aches and pains. The strength of this patch has more medicine than the Salonpas Original, and the patches are larger. There are a total of 60 patches per box, and they are easy to apply by peeling and sticking to affected area. There's a cooling feeling when the patch is worn, and the patch fabric reminds me of what the stretchy part of a bandage feels like. My mother has been the one to use these patches the most, to help with her chronic back pain. Jason and I have also used them for shoulder and muscle pain. The Salonpas Jet Spray is a favorite for Jason. He mostly uses it on his feet for temporary relief. It's applied by pointing towards the affected area and spraying. It contains menthol which provides a cooling sensation. It dries fairly quickly, and my son also uses it because he likes how it feels on his joints after a long run. As with any other pain relief products, there's precautions to follow. It's important to read and follow directions for each product. Salonpas does not take the place of the importance of seeing a doctor but their products can and do provide temporary relief for aches and pains. I, along with others in my household, have benefitted and felt the relief. 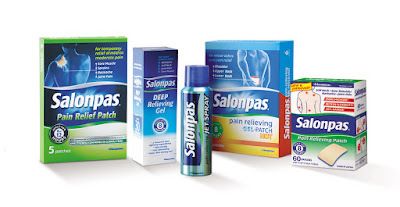 One person will win a selection of Salonpas pain relief products. I have back pain a lot. I tend to get lower back pain from being on my feet too much. Due to fibromyalgia I have muscular pain than seems to travel. I do have back pain as well. I have an old work injury in my shoulder, and numerous other aches and pains throughout the day. I have used Salonpas for over 15 years at the recommendation of an employer. I have used them ever since and love them. I also share with family and friends so they know the benefits, as well! I to have a lot of aches all over BUT the one that hurts the most is my shoulder and mid back. That is 2 places that a patch just will not go, cannot reach. So a spray would really be a big help. I also have times my hands just cramp and ache. I have to give up knitting because of this pain. these products would help me a lot. right now I have had both hips replaced and worry about my knees. i always have neck pain. Oh, I have psoriatic arthritis. It is worse in my hips and knees. I haven't tried Slaonpas yet, but I'd like to. I take so many other medications that this woulnd't react with. I woudn't have to worry about it. I suffer in my lower back and my right shoulder and lately my neck. I suffer from back pain daily. I would love to try this as all my pain is in my lower back. I mainly suffer from lower back pain. Oh wow, how much space do I have, lol. I have ankle and wrist pain from an accident that required plates, screws, pins ... the works in both joints. But the pain I would use the Solonpas for would be be the ache I get in my upper back, lower neck area. I would like to try the their spray pain reliever for my ankle that starts hurting every now and then. My hands and wrists hurt more often than anywhere else. Most often, I have pain in my wrists and my knees. Getting older ain't easy! I have regular pain in my shoulder and neck, but also problems with my lower back, elbows and carpal and ulnar tunnel pain. Most of these are a result of pushing wheels everyday instead of walking. I have arthritis and herniated disks. My neck often gives me the most pain and then second my lower back does. I usually suffer from back pain. I pulled a muscle in my back which is taking more than a month to feel better. With Fibromyalgia I have pain everywhere. But I had shoulder surgery last April and also injured my knee so those two areas are really the worst. I suffer from knee joint pain, foot pain, and back pain off-and-on. This product sounds wonderful. My husband suffers from knee pain. I suffer from back pain. I suffer from neck, back and knee pain that does not let up some days! My son has a lot of back pain from a previous injury. I get neck and shoulder pain. I have neck/shoulder and hip pain. I suffer with lower back and shoulder joint pain. I have back, neck and head pain. I unfortunately suffer from knee joint pain. Would love to try Salonpas to see if it would help my pain without having to take medication all the time. I have a lot of pain everywhere. My hip pain is the worst. Back, neck, head and spinal. Usually I get lower back pain. I deal with sciatic pain from a herniated disc. I suffer hip paion, as I am giong to be needing surgery soon. I suffer from severe neck pain and lower back pain. Well with Diabetes and Arthritis I do have a lot of painful moments. Especially in my neck area and lower back. The feet is a whole kind of different pain story with all the swelling. Where do I begin...... after breaking both of my feet (separate times) over the last 4 years and 3 surgeries later they probably bother me the most. I also have issues with my elbow, knees and back. I tend to carry my stress in my shoulder, so the patches would be a great product for me. I generally have back and knee issues. Think this might help me. When I do long distance backpacking, I sometimes get pain in my knees and back. I usually suffer from neck/shoulde pain. I suffer from lower back pain. I suffer mostly from back pain. I get back pain a lot due to my scoliosis. I usually have pain in my legs. I have pain in my hips. I have chronic back and neck pain due to an auto accident in 2007. I am always looking for a way to relieve the pain. knee pain from blowing out my knee which causes back pain as well. My lower back has been giving me grief for over 30 years! I suffer from lower back and shoulder pain. I have a lot of neck and shoulder pain. i get shoulder pain sometimes. I have pain mostly in my neck and lower back. My husband would get alot of use out of these products because we works construction. My husband has back and knee pain. I have a lot of neck pain and right hip. I recently fell and separated my left shoulder, had surgery and am trying to heal. My shoulders ache quite often and sometimes I have back pain. I have scoliosis so I have lots of upper and lower back pain. I usually suffer from neck pain. I suffer from chronic pain from arthritis in my spine and from bursitis in my shoulder. Husband suffers from lower back pain and I suffer from exercise pain. I usually suffer from neck and pain pain generally. My lower and mid back can be painful. I have suffered with knee pain for years and I recently fell on ice back on February 3rd and I am still in pain from that fall. I have suffered with Chronic pain since 1999. Nothing helps I would love to try these. Thanks for the giveaway. I have low back pain, knee pain, neck and shoulder pain. During the Spring and Fall, I suffer from knee and joint pain. My hands sometimes hurt from typing too much. If I put a topical cream or spray on them (for muscle/pain relief) it helps a lot! I would say back pain! I have joint pain and all over pain die to fibromyalgia. I also have lower back pain due to a crushed disk at my L5 S1. I get lower back pain. I have major neck and pain back especially when the weather changes. I usually have back pain. I have a medical condition, and numerous pains throughout resulting from an accident that wasnt my fault - the at fault driver that backed into me (pedestrian) had no insurance. I have wanted to use Salonpas for years at but cant afford. I also plan to share with family and friends so they know the benefits, too! Please say prayers as I have an upcoming appointment; I am hoping it will go fast so I can get back and rest the pain! My biggest problem area is my right shoulder blade region. I mostly have neck and lower back pain. I'd likely try it on my neck first, maybe that would even help my migraines a bit! I suffer back pain and leg pain as my job has me bending over and picking up heavy items all day. I usually have neck and back pain.